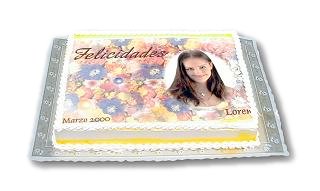 We can imprint with edible inks almost any picture or graphics file on edible paper. $20.00 USD for a 16"x10"-maximum print. Graphics compositions are available for a fee. S&H charges apply for shipping orders. We print on starch frosting sheets only. Starch frosting sheets are thin and incorporate easily onto buttercream and even more so on whipped cream. Frosting sheets can be applied to other toppings such as rolled Fondant, chocolate candy and Royal Icing. Frosting sheets should be protected from exposure to light and humidity before being used. They may last months if properly saved. Once they are used on a frosting, they will last according to said conditions. For instance, if applied on whipped cream, they only last no more than a day, while if applied on Royal Icing they may last weeks.